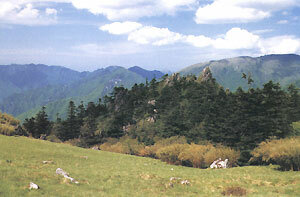 The Longmen River National Forest Park is located where the birthplace of Wang Zaojun (a Court lady of the Han Dynasty who volunteered to be an envoy of friendship and married t luanxie Khan of the Xiongnu), Shennongjia Primitive Forest and Badong County meet, 80 kilometers from the Three-Gorges Dam. Traversed by National Highway 209 and the Xiangxi River, the forest park has good transportation facilities, and is on the national tourism route of the Yichang-Xingshan MountainShennongjia Nature Reserve - Badong Shennongxi Tourism Area. The park has a total area of 4,644.4 hectares, and is divided into five scenic areas. The climate, soil and vegetation in the park have the characteristics showing the transition from south to north. Hence, botanists call it a "natural forest park. Some rare tree species, such as dove trees, corydalises and Xingshan elms, and some wildlife under first and second-class state protection, such as giant salamanders, golden-haired monkeys, musk deer and red-bellied pheasants, can be found here. 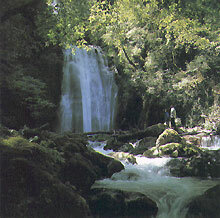 More than 10 karst caves are scattered in the national forest park. Coiling Dragon Cavern, which was the first to be developed, faces the east and is in the shape of a building, narrow above and wide below. The cavern is warm in winter and cool in summer, with the walls as bright and smooth as a mirror. There are several ponds inside it. Spring water that has kept dropping down for thousands of years has created stalactites in various shapes, which are named the Pagoda in the Dragon Palace, Magic Pin for Subduing the Sea, Coiling Dragon, Two Dragons Playing With a Pearl, Red Bird Spreading its Wings, Pheasant Hatching Eggs, Towering Pillars, etc.